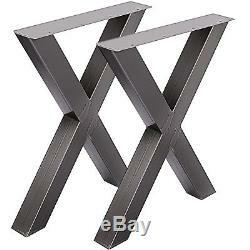 Black Table Legs X-frame Metal Dining Table Desk 720X600MM. We provide you with high quality table legs. These legs are made of steel. They are beautiful and durable. 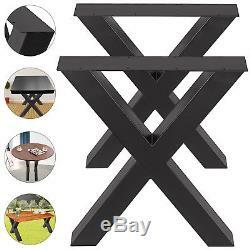 X-frame table legs will bring you a more stable experience. Meanwhile, these legs are painted with a black coating that makes it easier to pair with your furniture and bring a modern touch to your home. Good materials and sophisticated craftsmanship make our legs more delicate and sturdy than other products. 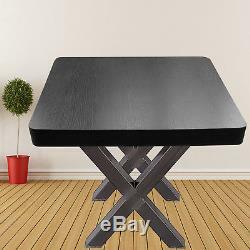 The easy installation steps allow you to build your favorite table at home. High quality steel to make these legs. 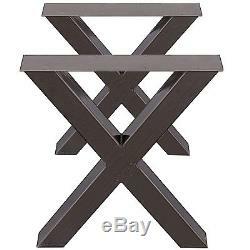 They can be used as a dining table legs and desk legs. Good material will keep it in good condition for decades. 720 mm high and 600 mm wide. Small size does not take up too much space from your room, and the maximum space utilization is improved. Black design of the whole body not only makes it look more fashionable, but also better matches other furniture in the room. Strong load-bearing capacity and they are completely suitable for daily use at home. 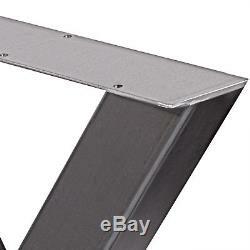 7.5 mm mounting holes on the legs for quick installation and easy operation. 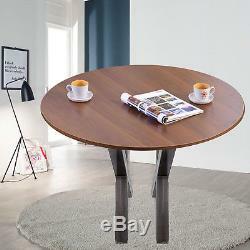 The steel leg of the table has good heat resistance and it is not easy to corrode or deform. And it is also not easy get damage and catch dirt. 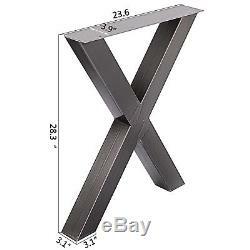 We offer you 720x600 mm (28.4x23.6 inch) table legs. The desk leg of this kind of size can use in the sitting room and also can use in small study room. Textured metal steel plus dusting process, matte texture is more advanced. 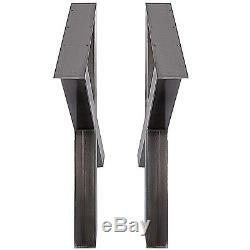 This table legs are simple and elegant, you can install them through the mounting holes. Steel table legs are firm and not easy ageing, their surface sprayed with black powder, air isolation, it's not easy to oxidize rust. Height: 720 mm (28.4 inch). 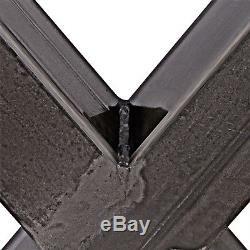 Width: 600 mm (23.6 inch). 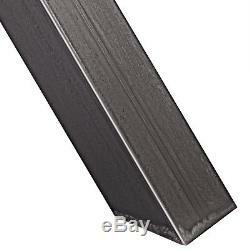 Mounting holes: 7.5 mm (0.29 inch). Single leg load bearing:1000kg. Package Size: 75 x 62 x 20 cm (29.5 x 24.4 x 7.8 inch). Gross weight: 18.1 kg (39.9 lb). As a leading and emerging company in manufactory and exporting business, we are specialized in Business and Industrial Products, Sporting Goods, Pet Products, Home and Garden products for more than 10 years. We believe that it is our vision and mission to provide innovative products with best service and competitive price to satisfy you. Our goal is to make sure that you can find exactly what you are looking for and make it easy for you to place your orders. If you have any changes, pls inform us. These charges are the buyers responsibility. If you need to return, please check twice to confirm the item not work and contact our customer service representative, let us know the detailed problem and send us some pictures for confirmation. Please make sure that item has NO man-made sabotage. Used items will not be accepted for return. All emails will be responded to within. You want to cancel an order. If you need further assembly instructions for a product. Any other unspecified questions or concerns. Special circumstances will be listed clearly in the listing. Please do check everything carefully after you received the parcel, any the damage except DOA (Dead-On-Arrival) would not be covered if it's your fault. A: The item ships from Rancho Cucamonga, CA, United States. A: Please log on your account. Q: How do I return an item? Please contact our customer service before you return an item. 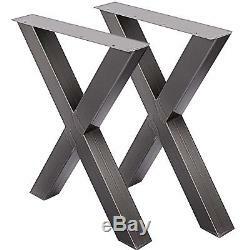 The item "23.6X28.3Table Leg X-Style Black Set of 2 Sofa Cabinet Computer Desk Legs" is in sale since Tuesday, December 4, 2018. 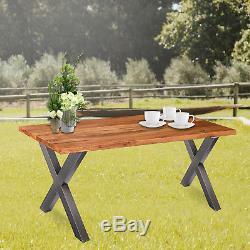 This item is in the category "Home & Garden\Furniture\Furniture Parts & Accessories". The seller is "popularitemstore" and is located in Ontario, California. This item can be shipped to United States, Canada, Mexico.